If you are serious about doing something fun and rewarding like this, and you are ready to get going now, I've put together everything you need to get started - including an everything-you-need-to-know Business Guide, an easy-to-follow system for doing lessons that you can copy for yourself, and a collection of ads and marketing materials (that I've tested and used) that you can use to get customers. This is stuff I wish I had when I started doing lessons. Now I've taken all the guesswork out of it for you. The Basketball Lessons Business Guide - an explanation of the whole business, the "Who, What, Why, Where, and How". It shows you everything you need to know...from what to say to parents...to how to structure your lessons. A Copy of My Book, "Shooting Fundamentals: How To Be A Clutch Shooter With Special Drills & Mental Training (A Guide For Beginners AND Experienced Shooters)" - I've given this to players who sign up for lessons. It's over 60 pages of instruction, drills, and charts that they can use to improve everything about their shooting. You can print it out and give copies of it to your players, or you can use it as an example if you want to create your own book. My Coaching Resource List - This is my list of the best books, videos, websites, and products that I use for my lessons. (For example, there is a unique basketball that's perfect for one of the drills that I do. You'll know where to get it, and why it's so great to have). 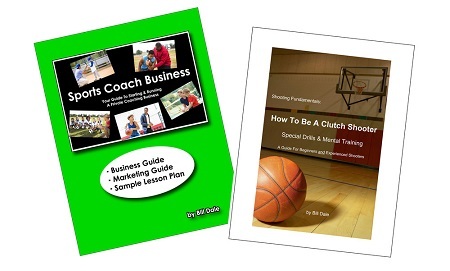 The investment for this basketball lessons business "blueprint" is just $29 (plus Shipping). You'll recover all of this amount in your first week of lessons. And you won't have to spend time (or waste a lot of money) trying to figure out how to design flyers, or how to come up with ads, or what to say to parents to get them to sign their kids up, or even how to structure your lessons. I've already done all of that expensive, time-consuming work for you. All you have to do is copy what I've done to get started. Then, later as you get money coming in, you can test other ways, or put your own "twist" on this stuff and make it how you want for your situation.